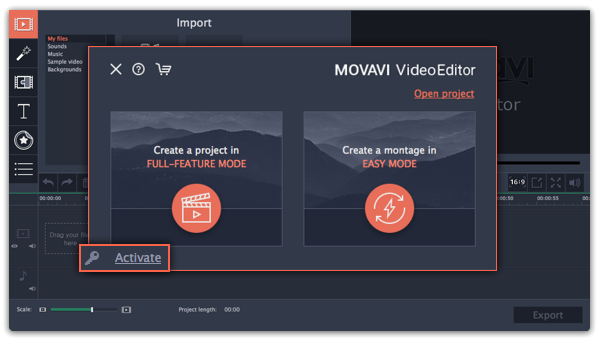 How do I activate Movavi Video Editor or Movavi Video Editor Plus (Mac)? 1. Launch the version of Movavi Video Editor you have. If you do not have the program installed, please use the Downloads list or the Lost Key form to install the product. 2. Click 'Activate software' at the startup window. Else, select the menu that has a program name. 3. Paste your license Activation key. 4. If you have no Internet access or use a firewall please follow the offline Activation scenario.